Cobblers boss Keith Curle has praised his players for creating the right ‘environment and culture’ which has allowed the team to thrive on the pitch and turn around their fortunes in recent weeks. Following last month’s goalless home draw with Crawley Town, when the players were booed off by some sections of the PTS, Curle warned Cobblers fans he would require ‘time and transfer windows’ to change the ‘culture’ of the club. There hasn’t been any sulking. There’s people who are disappointed, people who are angry and people who are frustrated but you’re going to get that at every football club. But two away wins later, achieved at Stevenage and Crewe, and Curle was again speaking about the importance of working within the right ‘environment’, except this time it was in a positive sense. “It’s a case of everyone playing their part and that’s not only the starting 11, it’s about the squad, those that travelled and even the players that didn’t play because they still play a massive part in the environment and in the culture throughout week, which is pleasing,” said Curle. “There hasn’t been any sulking. There’s people who are disappointed, people who are angry and people who are frustrated but you’re going to get that at every football club. 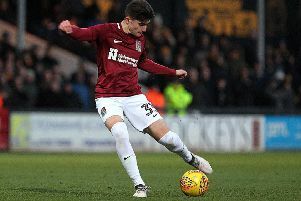 Saturday’s win at Gresty Road lifted Cobblers 15 points clear of relegation in League Two and stretched their unbeaten run to five games, but Curle admits that’s far from the limit of both his and the club’s ambition. “There’s still more to come from us but your foundation is negating the opposition’s threat and then expressing yourself with the ball in the right areas and we did that against Crewe,” he added. “They had one or two good passages of play but on their day they can make anybody look open and exposed.